Assembling an engine is as easy as 1,2,3, repeat… a couple hundred times. Everyone loves a good How-To, but occasionally all you really need is a quick checklist to remind you to dot your i's and cross your t's. 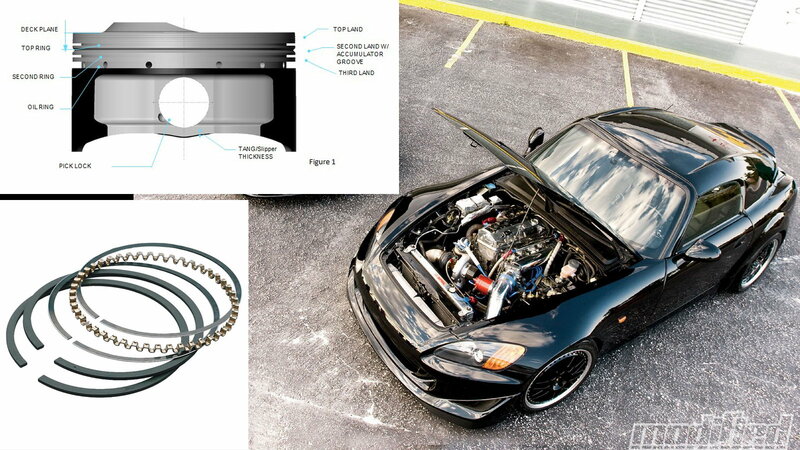 While we were getting older, and our eyesight was getting worse, the world's brilliant engineers were improving the efficiency and performance of our engines by making piston rings thinner. Great! But not so easy to see, and kind of easy to mix up. Those same engineers have come up with a variety of ring cross-sections as well, further complicating the process of telling one ring from another, and up from down—a chamfer doesn't necessarily mean 'this side up'. As always, it's essential to follow the preparation and installation guidelines provided by your ring set's manufacturer. Start with the 3-piece oil control ring set at the bottom of the piston, making sure the gaps in the two oil control rails, and the expander that separates them, are 120 degrees apart. Check to make sure the ends of the expander aren't overlapping as well. Moving up to the 2nd compression ring and finally, the top compression ring, keep your eyes peeled for pip marks (dots) on them—they always face up. The ring gaps on the top two rings should also be rotated so they don't line up. Done? Good. Now go back and double-check everything again. >>Join the conversation on Quick Assembly Order Checks right here in the forum. Connecting rods are marked so that you don't mix the caps up or put them on the wrong way, but there are still a couple of mistakes that are pretty easy to make, and really annoying to have to go back and fix. The first one is piston orientation. You want to make sure the piston dome shape, and valve reliefs if your piston has them, are pointing the right way. It seems obvious but, depending on what position your engine is in when you are assembling it, down could be up and left could be right. The second check applies to engines in which two cylinders share one journal. It's vitally important to ensure that you have the chamfer on the rod big end (and bearing) facing the crankshaft fillet, and away from the other cylinder's rod. Check everything again before you torque down the rod bolts to avoid damage before it happens. 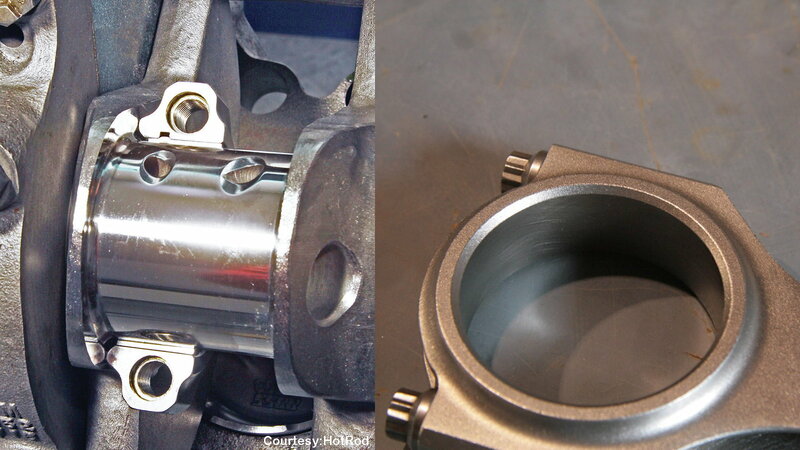 Connecting rod bushings probably seem straightforward: make sure they fit, are the correct size, and don't protrude past the ends of the rod. There's more to it than that, though. Check that you didn't scrape a curl of metal into the oil feed hole, or holes when you pressed the bushings in. 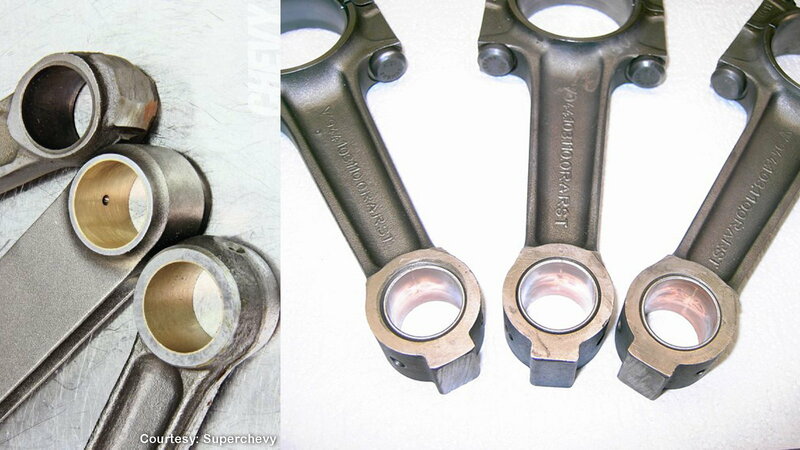 Pressed-in bushings usually need to be honed to size and then cross-hatched for oil retention. Check that the oil hole(s) in your bushings align with the oil holes in your rod and if they don't line up 100% drill them out so they do (being careful not to drill too far and damage the bushing opposite the hole). To finish up, break the edges of the oil holes, and the outer diameters of the bushings, so they aren't sharp. See that big photo, the one with someone pulling a seal out using a paint can lid pry tool? Don't do that. If your engine block/crankcase is aluminum you'll put marks in the metal that could affect the fit of your seal or allow oil to leak past the outer diameter. There are specialized tools for pulling seals that either hook or thread into them, leaving other parts untouched. Okay, now that that is out of the way... install oil seals so they face inward, meaning they are cupped toward the oil you want to prevent from leaking. Often there will be a spring that keeps tension on the internal diameter of the seal. Always tap or press seals in evenly, don't "walk" them in unevenly as this could cause distortion and prevent them from fully seating. 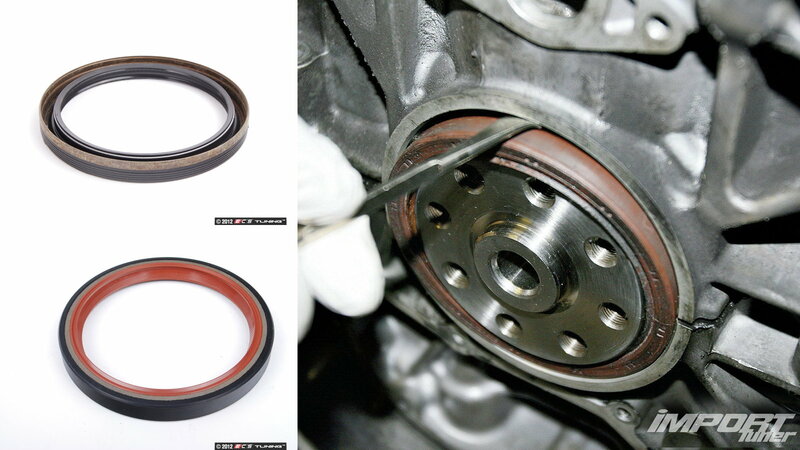 When installing seals put some lubricant on the internal diameter sealing area/lip so that it slides into place easier and prevents wear upon initial start-up. Check manufacturer recommendations and prohibitions regarding the type of lubricant to use for this, also—some applications use seals with dual sealing ridges and call for the area between the ridges to be lubed. What could be more straightforward than a washer? Turns out even washers sometimes have heads and tails. These days ARP fasteners are quite popular, and a popular feature of ARP head washers is the inclusion of a chamfer on one side (see lower right photo). If your engine uses head bolts, the head washer chamfer faces up, towards the bolt head. If there isn't a manufacturer guideline for your engine or application you can still figure out the ideal orientation by looking at a couple of characteristics. 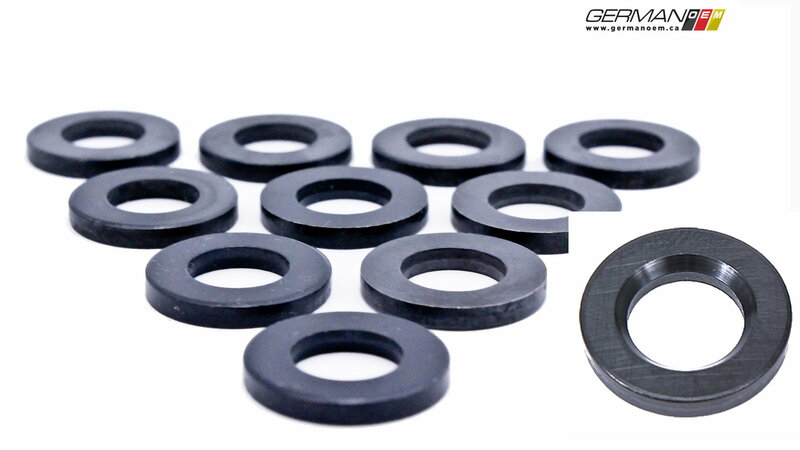 Many washers have a bit more of a gentle curve to one side of the outer diameter. If you have aluminum heads it's better to have this side facing your head, rather than having the sharper side potentially dig into the casting. When it comes to thrust washers, the machined side of the washer will always face another machined or ground-flat surface, with any non-machined surface facing the fastener. As always, double check everything. With so many identical and near identical parts in one single engine, it would be superhuman if you didn't catch at least one slip-up.